The regally bred Don Eduardo (Zabeel-Diamond Lover) is again available to breeders this coming season on a walk in basis of $3,300 Incl GST. The 2002 Gr 1 AJC Derby 2400m winner created shockwaves in the Karaka New Zealand Select Sale of 2000 in South Auckland when he was knocked down to Gooree Park Stud Principal Mr Eduardo Cojuangco for the then Southern Hemisphere record Price for a yearling of $3.6 Million NZ or $2.7 Million AUS. Sold by the Legendary New Zealand breeder Sir Patrick Hogan off the draft of the world famous Cambridge Stud, Sir Patrick described the Zabeel-Diamond Lover colt as the best yearling he had ever offered for sale! Later to be named Don Eduardo after Mr Cojuangco's late father, the handsome colt was entrusted to be trained by hall Of Fame Trainer Lee Freedman and he didn't disappoint on the track winning three times at Stakes Level with prizemoney earnings of over $1.6 Million. Don Eduardo, although getting on in years, is still a magnificent type of horse and is free of Danehill Blood. 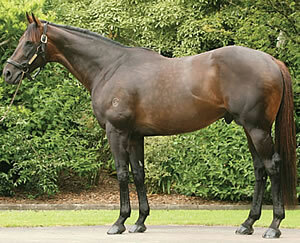 He gives breeders an opportunity to breed to a son of the great Zabeel from one of the best families in the Stud Book. He is available on a walk in basis at a Stud Fee of $3,300 Incl GST. For further details contact Stud Manager Andrew Baddock on 0412685003 or email andrew@gooreepark.com.au or Erin Monds on 0400390626.